Optical particle counting is widely deployed in cleanrooms around the world as a means for counting and sizing the number of particles in the air. Most people who have ever worked in a clean room, are familiar with the Federal Standard 209E cleanroom classifications, such as class 10,000, class 1,000, or class 100, with the lower the number corresponding to the cleaner the room. Where many people have misconceptions is that the classifications are not solely determined by the number of particles in the air but also their size. For example, to be classified as a class 100 clean room, it must have no more than one hundred 0.5-micron participles per cubic foot, but it must also have no more than twenty-two 1-micron participles per cubic foot and can have as many as three hundred 0.3-micron particles per cubic foot as well. Therefore, it is imperative for optical particle counters to measure the size of each particle it counts. As we will explain in this blog post, optical scattering intensity is dependent on both particle diameter and the wavelength of the scattered light, making it imperative to use a stable monochromatic light source, e.g., a laser. Optical scattering is divided into three different regimes, known as Rayleigh Scattering, Mie Scattering, and Geometric Scattering. A detailed investigation of these three scattering regimes is beyond the scope of this blog post, but it is important to point out that the ratio of the particles circumference to the laser's wavelength will determine which regime the scattering will fall. When this ratio, often referred to as the size parameter, is much less than the laser wavelength the scattering will be in the Rayleigh regime. When the size parameter is on the order of the laser wavelength, the scattering will be in the Mie regime, and when the size parameter is much larger than the laser wavelength it will be in the geometric regime. While in some extreme cases optical particle counters, may be needed to measure extremely small or large particles, in most cases the particle sizes of interest range from a few hundred nanometers to a few microns putting them well within the Mie scattering regime for visible light. The exact equations underlying the theoretical model of Mie scattering are too complicated to cover here, but solutions can be calculated using numerical methods. As an example, the figure below shows the theoretical Mei scattering intensity curve for a 633nm laser as a function of particle diameter. 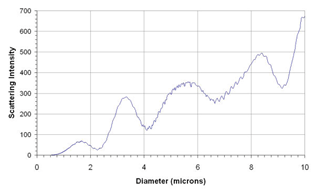 In practice these theoretical curves are not used to determine particle size, but rather a system would be calibrated by measuring the scattering intensity from a wide variety of known particles and developing a calibration curve. This method takes into consideration any variability introduced by the instrumentation, as well as slight deviations from the theory for diameter extrema. 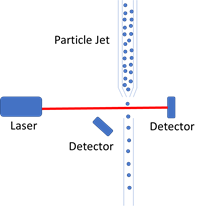 To measure the light scattered by each particle, a particle jet is used to direct a stream of individual particles through the laser path. One photodetector is placed directly in the path of the laser while a second detector is situated in a slightly offset position to measure the scattered light. A simplified schematic diagram is shown below. When utilizing this set-up, it is imperative that you use a single spatial mode laser, because if there are multiple modes present in the laser beam path the relative scattering intensity will be much more difficult to calculate because it varies depending on which mode the particle is interacting. This is because the intensity of the scattered light is highly dependent on the laser intensity, and in a multimode laser beam the scattering intensity will vary from mode to mode. To further complicate this issue the modal power distribution in a multimode laser can also change over time, making the development of a calibration curve virtually impossible. In addition, to requiring a highly stable single-mode laser source, it is also essential that the laser power be sufficiently high as to be able to detect the scattering induced by smaller sub-micron particles. This intuitive idea is further demonstrated by the Mei scattering plot previously, where the scattering intensity trends down as the particle size decrease. 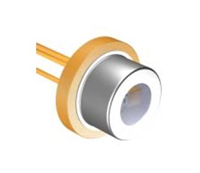 Here at RPMC we offer a wide range of visible single mode laser diodes from Wavespectrum which are ideal for integration into optical particle counting systems. These single-mode diode lasers are available in both free space and fiber coupled packaging configurations, with power outputs up to 250mW and wavelengths as low as 405 nm. These lasers feature a low threshold current and high slope efficiency resulting in a low operating current providing high efficiency while enhancing reliability. The low power consumption of these diode lasers also makes them ideal for integration into portable battery-operated optical particle counting systems. For detailed technical specifications on the full range of single-mode diode lasers from Wavespectrum click here or talk to one of our laser experts today by calling 1-636-272-7227 or click here.